It all started so casually with a simple question: “Ever had hummingbird cake?” An image of four and twenty blackbirds in a pie immediately started to swirl through my mind. But I knew that wasn’t the correct answer. No, I’d never even heard of it. Kathleen Cwirko, the talented stylist who helped to orchestrate the photo shoots for my upcoming cookbook gave me a quick smile and wrote down the name of the cake on a little piece of lilac paper. She handed it to me and I tucked it away and promised to look it up when I wasn’t in the middle of finishing a cookbook. Finally, after much too long a time, I started to research the cake: I discovered that many people consider it the southern equivalent to carrot cake; I found that it harkened back to the mid-1800’s here in this United States, and that the recipe had evolved over time; I read about the folk legend that says it’s so good, people will hum with happiness after they take a bit. Southern Living ran a version of hummingbird cake originally submitted by Mrs. L. H. Wiggins of Greensboro, North Carolina in 1978, and it went on to became the most requested recipe in the magazine’s history. And in 1990, that same recipe was heralded as their recipe of the year. Some of you in-the know-southerners might be licking your lips right now. But if you grew up north of the Mason-Dixon Line, like me, you may not have been introduced to the magic of hummingbird cake. So let me fill you in. That original Southern Living recipe made a rich, three layer cake that featured pecans, ripe bananas, crushed pineapple and ground cinnamon. It’s really like a pecan spice cake laced with banana and a touch of pineapple. 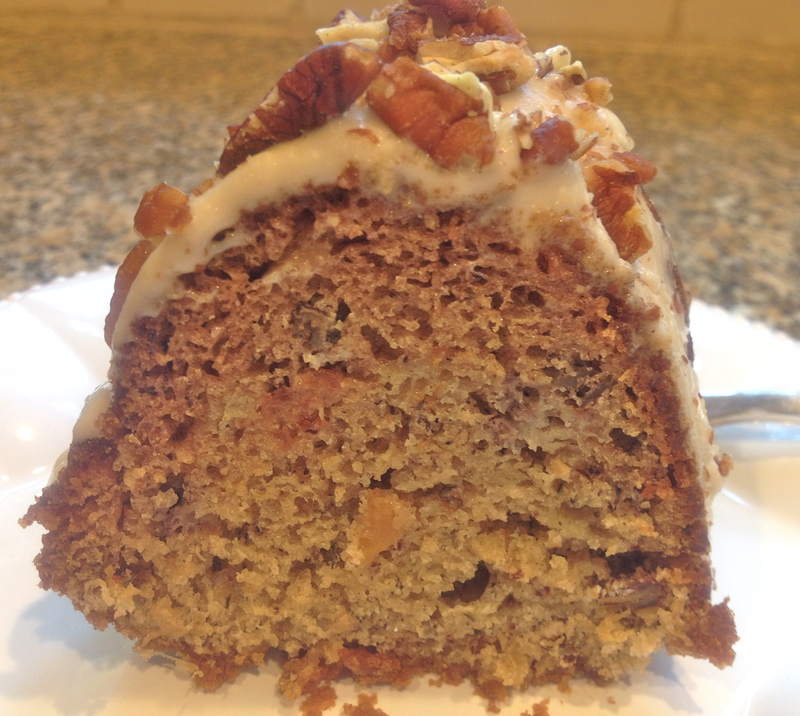 The cake is frosted with a sweet, cream cheese frosting, and then chopped pecans are sprinkled over the top. Hmmmmmmm. Southern Living knew they had a good thing, and they ran several variations over the years that included a “mile high” version, a “lightened” version, and a Bundt cake version with a cream cheese glaze. The Bundt cake looked mighty good, so I decided to give it try. I started with the wheat-based Southern Living recipe and tweaked it a bit to create my gluten-free version. Their recipe made a large cake that called for using a 14-cup Bundt pan. But I cut it in half and was able to use a smaller, 10-cup Bundt pan. I adjusted the ingredients, added a little bit of xanthan gum and into the oven it went. What a delicious cake! See the original Southern Living Hummingbird Bundt Cake here. I served it to my family and several unsuspecting dinner guests (all northerners) at a dinner party over the summer. My guests were admittedly a bit suspicious, and maybe even a tad bit hesitant about trying such an unknown “delicacy,” but they all succumbed once I told them about the legend. I cut slices and passed them around. Soon my table was filled with melodic humming and requests for seconds. Success? Well maybe. I knew it was delicious, but was it the real thing? Want a little music at your next dinner party or brunch? Make this cake and let the humming begin! And thank you Kathleen Cwirko for introducing me to the magic of hummingbird cake! 1. Preheat oven to 350ºF. Position rack in center of oven. Bake pecans in a single layer on a baking sheet for about 6-8 minutes, until lightly toasted and fragrant; stir once or twice, as needed. Cool pecans and then coarsely chop. 2. Lightly grease a 10-cup Bundt pan (9 inches across the top x 2 1/2-inches) with cooking spray. 3. Whisk flour, 1/2 cup of the chopped pecans, baking powder, baking soda, xanthan gum, cinnamon, and salt in a small bowl. Set aside. 4. Beat eggs in large bowl of electric mixer until lemon colored. Add granulated sugar; beat until smooth and thick. Add bananas, pineapple, pineapple juice, and vanilla and mix until well combined (you can leave tiny pieces of banana in the batter). Scrape bowl. Add flour mixture and oil and beat at medium-low speed for about 30 seconds; scrape bowl to incorporate all of the flour mix. Do not overbeat. 5. Spread batter into prepared pan. Place in center of oven and bake about 45 minutes, or until a toothpick inserted in the center of cake comes out clean. Do not open oven for first 40 minutes. 6. Cool cake on a rack for 8 minutes. Carefully remove cake from pan and cool completely on rack. Move to cake plate and spoon Cream Cheese Glaze (recipe below) over top of cake and let it drip down the sides. Sprinkle with remaining 1/2 cup chopped pecans. Serve at room temperature. Cut with a sawing motion with a serrated knife. Can be made a day ahead. Store cake in refrigerator, covered tightly with plastic wrap. Can be covered with plastic wrap and then with foil and stored in freezer for up to two weeks. Best when eaten within three days of baking. 1. Beat cream cheese in large bowl of electric mixer until smooth. Add vanilla and milk, then gradually add powdered sugar and beat until light and creamy. Add more milk, 1 teaspoon at a time, to thin as needed. Thank you so much for your kind words! I hope you enjoy the cake as much as I did. And I promise the new book will have a lot of other delicious recipes that will keep you baking through the holidays –and after that, too! Hope you had a great summer and that you’re getting in the mood to do a little autumn baking. Hummingbird cake might be just the thing to start you off. Let me know what you think about it once you give it try. I was so happy to see this recipe on your blog! It looks fantastic and I cannot wait to try it. Also, I am very excited that you are coming out with another cookbook because you simply are the best. It is 5 years now that I have been celiac/gluten free, and your recipes are the ones I rely on all the time. I’ve experimented and learned enough by now to know that you are really the leader in gluten free baking. I am so grateful for all I have learned from you. I do have a question for you in regard to the brown rice flour mix. When I purchase a 3 lb. bag of the Authentic Foods extra finely ground brown rice flour, I like to use the whole bag to make a big batch of flour mix. I measured it out once and came up with an additional 3 cups potato starch and 1 1/2 cups of tapioca flour. Is this the right proportion? Would you consider adding this info/correct proportions to the flour mix chart in your new book (or just let me know)? I know it’s a lot of flour mix, but my house right now is full of hungry teen/pre-teen boys. I know you know what I’m talking about! So good to hear from you! And it’s really nice to know how much my work is making a difference to you and your family. I remember discussing the flour-mixing-by-the-bag-thing with you a long time ago, but I still only use measuring cups and/or weights when I make up large batches of my flour mixes. I’ve also started using the GF Classic Blend from Authentic Foods a lot- which means I rarely make my all-purpose mix myself. But perhaps now, I will try to do it using the whole bag of brown rice flour, as you do. Might make sense since- especially when I’m testing a lot of recipes! I will be able to add the results to this blog, but it is too late to get it into the book. I’d would be interested in knowing your results. Hello this sounds delicious. I have been trying hard to go gluten free since my diagnosis of MS in June of this year. My question is can we substitute applesauce or coconut oil or butter for the canola oil.? I have been elimating canola oil also. Although I didn’t test replacements for canola oil (and neither did my field testers), I think you might be able to do it without too much of a problem with this recipe because there is so little oil. But if it were me, I’d try melted butter and applesauce before coconut oil. You might also consider grape seed oil – if you are not avoiding it. I wish you much success in your efforts to adapt to a gluten-free diet. I’ve heard from many people who have been diagnosed with MS who told me that avoiding gluten really helped them. Please let me know if you have any other cooking or baking questions that I can help you with.